The "cube" in the subtitle is of course the white cube of Brian O'Doherty's 1976 essay "Inside the White Cube" (these days available in book form) -- not just the gallery as a physical space, but the gallery in its role as a temple for commerce and contemplation, the gallery as a context for art. It's a context that has changed surprisingly little in the almost 30 years since O'Doherty challenged it's presumed neutrality. So what does it mean to talk outside the cube? "For years people have been concerned with what goes on inside the frame. Maybe there's something going on outside the frame that could be considered an artistic idea," Robert Barry said (back in 1968). Generations of artists have puzzled with the boundary of the picture frame (or, more generally, the art object). However much life lies within that boundary, inevitably the life that lies outside it is vastly larger, messier, more varied, intense, complicated, provocative, and real. Movement after movement (indeed virtually the entire twentieth century enterprise of art) has attempted to alter the frame to hold more of life. However, while there has been a lot of talk about abandoning the frame most art activity still takes place within it. The white space of the gallery (museum, etc.) is a version of that frame. The gallery is a formal way of defining what is art (ie, anything shown in a gallery is art). During the 90's the increasing informality of a great deal of artwork (abject, messy, low-skill, assemblages of 'ordinary' objects etc) put additional pressure on the formality of the gallery space to define the 'artness' of something. In this way, work which might superficially appear to stand against the market and institutional forces constraining art actually served to reinforce the boundaries containing it. Today, the amazingly vigorous art market pulls all participants in the art world farther towards what can be bought and sold (objects of one kind or another) and galleries are often almost indistinguishable from the designer boutiques that cluster near them. Just outside, graffiti, stickers, posters, and other street interventions assert art's ability to function without such formal boundaries. Street art accepts the noisy, uncontrolled, life-filled context of the city's outdoor spaces. And if we look just outside the boundary of the object, experiential, situational and participatory forms of art move the material and content of art toward what happens in and between people, despite the difficulties of controlling or even defining what occurs. The writer of one recent book on interactive design (Chris Crawford) defined interactivity as a kind of conversation. We can flip that and recall that conversation is a kind of interaction. An artwork that interacts with us is an artwork that comes to know us (in however fragmentary a way) not just an artwork that we come to know. Artworks as traditionally thought about are supremely narcissistic in their insistence that there is little for us to do besides contemplate their beauty (or truth, meaning, etc.). As Freud famously noted, "it seems very evident that another person's narcissism has a great attraction for those who have renounced part of their own narcissism and are in search of object-love. The charm of a child likes in his narcisissm, his self-contentment and inaccessibility, just as does the charm of certain animals which seem not to concern themselves with us such as cats and the large beasts of prey." I think we could add to this list the charm of many works of art (if paintings can be said to be narcissistic in this way, how much more so minimalist sculpture, but how many traditional works of could be said to care about us at all, except insofar as we are there to 'receive' them?). For more than a century (somewhat casually marking a beginning with Dada) there has been an alternate tradition of art practice which has struggled, more and less successfully, to break through the glossy sheen of the self-sufficient artwork, and find something more related and interpersonal. Something less like a monolog and more like a conversation. It's my personal feeling that this kind of work is extraordinarily difficult, both to do well and to think about well. This goes part of the way towards explaining why it keeps appearing and receding again in successive waves of effort and exploration. While working in two projects in 2002, the Free Biennial and Free Manifesta, both involving open calls for artists working in public space, I discovered there were many more people working now in these artistic areas than I had realized. 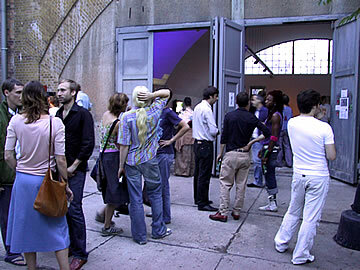 Pieces in those shows included, interactions, interventions, lessons, psychogeographic walks, street art, mail art, net art, telephone works, parties, and situations. Often, the artists involved showed their more conventionally material work regularly in galleries, but kept this alternate practice quietly alive in their studios and on the streets. Some artists who we rarely hear about continue the situational and conceptual work they have been engaged in since the 1960's. And of course there are groups who have essentially abandoned the context of the art world entirely to develop networks and practices of their own (mail artists, net artists, political artists). The artistic practice continues, but largely outside of the current critical discourse. (This is somewhat less true perhaps in Europe where a system of state supported kunsthalles, museums, and biennales defines what is dominant in the art world there, and we might note the French critic Nicholas Bourriaud in particular for taking an interest in works of art which, however obliquely in some cases, involve forms of social interaction). If we can think if the cube as the boundary of the art object, and also of the rooms which usually contain it, we can also think of the cube as the intellectual dimensions of the square and rectangular magazines and journals in which most art criticism is published. I enjoy a glossy art magazine as much as anyone else, but like the galleries and museums which pay their bills art magazines are typically dominated by art which has financial value. It seems slightly comical that after decades of commodity-critique we could still conflate the financial value of an artwork with its intrinsic or artistic value, but indeed, much of the time, this appears to be the case. We live in the time of the most powerful art market ever known -- of course this is going to have an influence on what it is that we see and talk about, but it's equally obvious that this need not overwhelm the discussion and thinking about art, meaning, and value. We also live in a time when the costs of publishing have (via this internet we're floating around in now) become vanishingly small. It's easy enough to make something new, to start whatever kind of conversation we might want to. To talk outside the cube means to talk about works of art which don't fit the confines of the object or the white room. It means talking about works which take place in more public and social space, works in which there are participants rather than audiences. It means talking about work which is relatively neglected by the current critical discourse, and finding a language for this kind of talk. It also means looking to intellectual disciplines beyond art history and criticism for inspiration in developing that language. I invite all readers to join the conversation here -- to comment on what is published if they wish to, and also to send in their own accounts, artistic statements, and analyses. Write to talk [at] intheconversation [dot] com.